- Ticking the AND option narrows your search and gives a smaller number of results. - Ticking the OR option widens your search and gives a larger number of results. 3. 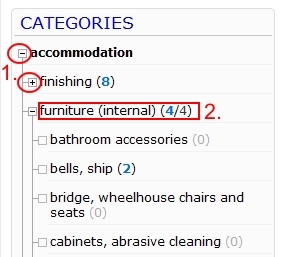 BROWSE THE CATEGORY TREE - you can manualy browse category tree byexpanding particular sub-categories. 1. click the singn to expand or hide subcategories. 2. click the category name to see the product list.